I stopped the Land Rover on the roadside as this small elephand was in good light, his continued eating the greenest freash grass from recent rain and walked right up to us, undetured by the cicking of cameras. At about 2 meters he winked that eye and walk behind the car across the road and disapeared into the mopane forest. A great start to the day. Location photography is a very demanding discipline in Africa, we have harsh light and lots of it, our golden hour is closer to 15 minuets, our sunrise or sunset is over just as quickly. But when the magic happens its all worth while, in amongst all the trees we need to see the wood and many times the best place for a camera to tell its story is 5 to 20 meters (16 to 70 feet) up and nearly always over water, its long been a problem for me and I've used full size helicopters when budget allows and various pole contraptions when not, in order to 'get that shot' over and above the normal, difficult to explain to none camera people, its just a madness we have. I've been following the development of various remotely controlled flying machines over the years and embarked of the steep a learning curve that resulted in the purchase of a DJI Inspire 1 almost a year ago. I arrived I January of this year and after reading the instruction quite a few time got it off the ground and back down again safely. Many many test flights have since passed most without indecent. Flying is one thing and then comes operating a camera at the same along with the odd tree jumping out in front of it ! Cows run away, dogs give chase, donkeys stand still and small children come running then go screaming almost as fast. 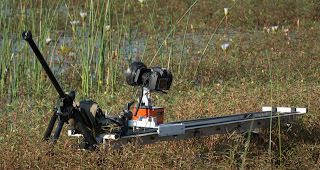 Next came the panning, turning and rises required for filmmaking, many hours have passed and extra batteries purchased. The main problem in fim was to get the shutter speed down as the X3 camera is fixed at f2.8 so a set of neutral density filters was ordered, now the system is working well. 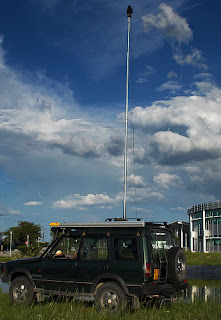 Jumping from my DSLR to such a small camera system was showing in the still images and the limited dynamic range more evident in our very demanding discipline in Africa. Last week DJI announced the new X5 camera for the Inspire 1, its a full MFT size with 13 stops of dynamic range... The deposit is paid and time will tell. Oh the waiting! Following our meetings in Maun our first trip to Laroo La Tau lodge was to interview possible leads for our 'tourism impact on community' film, at this stage we had three possibilities to run with, first up was was a lady that had worked her way up from housekeeping and found a passion in the guest interactions of being a waitress, then there was a 'wildlife guide' from an incredible family that included an accountant, school teachers and two professional football players! But the story that was the best for caring our message was Ruben, school dropout that through tourism got steady employment and the space to grow and became the 'head chief' in the lodge where he started as a 'gatekeeper'. As it was our new dates allowed some construction of LED lights and a quick on-off, yes they work test. And off we go on the 2 hour drive to Laroo La Tau lodge. By the end of day 1 we have settled into our luxury rooms and had a briefing with Ruben and even made time for a quick scout of his home in Kumaga village where the first day of shooting will take place. An early start was planed and executed by some, others finding the 5C temperature a little too frosty, its winter in Botswana. My crew looking like very old ladies wrapped in blankets and shuffling along... The idea of getting warm by moving around, getting busy even doesn’t work here! Anyway only an hour after sunrise we arrive at the location, it's already evident Ruben and myself are going to make this work! Others can hang on for the ride but can't stop the show. Progress is slow to start and by the afternoon we are getting most of the shots, home make lights working better than expected. Batteries hold out and the first day is done. The second day was to be in the kitchen and scullery and went quite well we also made time for getting a couple of supplementary shots and cutaways. Footage reviews looked good and double back ups made. My crew are now even more relaxed and aren't quite realisation that filmmaking is hard work. Delegation isn't my strong point, having to say everything 2 or 3 times just annoys me, I'm knackered. Day three, today we have some extras arriving to be in the safari car and at the diner table, this is the only day we can film at the gate, with safari staff, pretend guests and drivers. Its the same day we are hit by a cold weather front, the temperature plummets, the wind is howling and the crew are still in bed... breakfast is hot and Ruben and I are ready... others slowly emerge wrapped in even more blankets than before and decide to sit in the sun to warm up wether or not in my shot, filmmaking is now second to keeping warm for my grandma crew. The wind rendered almost all sound recording useless, sand and dust was getting in all exposed orifices, equipment and operator! And more by luck than judgement the footage was recorded, reviewed and backed up. Ruben and I had 20min to do his finishing 'piece to camera' but his chef uniform was at home 25min away, 2 crew and a driver went to recover the uniform but got delayed in action and only returned 2 or 3 hours later... As the 'no hurry' in maun turns into 'no show up' in Kumaga. By now the diner table has been set and for our climax to be shot, all instruction has gone by way of the chief uniform and tables need to move, power sockets aren't working our extra's are taking brimming advantage of our hosts generosity in the bar area. what ever you are imagining now, X10 and get close. The BHS film wasn't made but just that clip could have done six numbers on a media channel I'm sure, and if I was down for a heart attack then that would have been the moment. Last day, some safety shots, and as we get lucky on the last day with the opening chicken piece. Packing up was without any major event or non event and back to maun we head. That's about how the shoot went down, am sure some of you can relate, hey, what a ride! Alwyn Peterson is a Maun based architect in demand, time is always short for this man, he's also camera shy and has never seen a picture of himself that he likes! Now thats a challenge if ever I've had one. The man at his desk was the fastest choice, and to speed up the process even more I decided to use my new LED lights. Working with the desk light that had a horrible energy saving bulb, this could be dealt with in post with a little light painting as can be seen above. The 1st LED light placed on a stand over and behind Alwyn ,the other held by Gaone my voice activated light stand (VOLS) a quick exposure adjustment and it was all over in 4 frames! Alwyn was happy with his new found self on the camera's screen, no longer resembling Gollum as he most feared.. happy client – happy photographer. 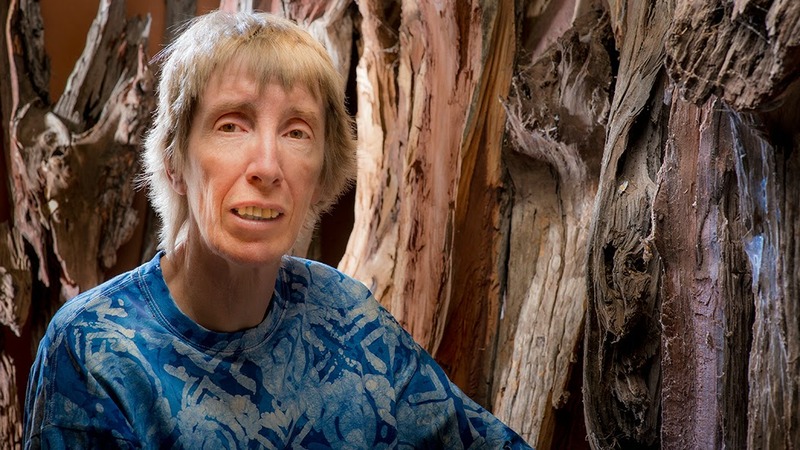 Last week, Christiane Stolhofer requested a portrait with a brief, “I want to be in amongst the woodpile” well known and excellent sculptor Christiane says the the wood talks to her, in the same way light talks to me, if that makes any sense to you ?! So what started out as a simple request became quite complex once the scene of the crime was decided, our space was only a meter wide and 3 or so meters in length, the concrete table obstructing us being part of the floor! Our main light, my biggest soft-box, balanced over the camera, all straight forward so far, but now that woodpile background. The old tree pieces were lined up behind and then along the wall giving a 3D effect and a large aperture put the background out of focus whilst keeping the woodpile feel and Christiane sat cross legged on the floor. A couple of years back, I was looking for a new light weight tripod to use while walking on the beaches in North Devon. After some online reading and comparison decided on the Giottos Pro carbon fiber 8361B, it is light and a good height. the legs can be spread for lower level work and the top can be angled over which comes in useful. Having decided to make a few photographs on this 2014 trip to the UK so asked my brother to bring the tripod when he collects me from the airport, t was all wrapped up in a towel and just like new except I noticed the 1 of the leg locking leavers was cracked, it sill worked but was hanging by a thread, so to speak. I looked up the distribution agents Daymen in the UK and fired off an email (with I must admit a certain amount of sarcasm) about my disappointment in the tripod etc etc... I was surprised and very happy to get a reply from Joanne the very next day enquiring as to which leg locking leaver was giving the problem, to which I replied. The very next day I received a new part completely free of charge and because the tripod comes with a small tool kit the replacement part was installed in about 5 min and is now working very well again. Moving on from moving pictures, I put cinema graphs to the test with some still images in this sort promo for a local hotel.. spot the actual video clip ! On our last shoot at Maun Lodge with Kathy Jay Naval, I took some time to capture some short video clips. Cinemagraphs are another way of making images more interesting on the internet without the download time of a video.. I like the effects and am working of some more creative ways to get my clients noticed ! its sad that FaceTube dosen't allow this kind of file but its an old internet standard with a new twist . . Working on a new add for a hotel.